Dare County is located on North Carolina’s Outer Banks and is the easternmost county in the state. Pedestrian and bicycle transportation is common among the individual towns, not only as a mode of commuting, but also as a way to explore the natural environment and enjoy the mild weather. Between 1997 and 2012, there were a total of 230 vehicle collisions involving bicycles in Dare County. Over 50 percent of these crashes resulted from a vehicle failing to yield. In the same time period, there were 195 traffic collisions involving pedestrians. Seventy percent of these occurred at midblock locations. These trends demonstrated a need for education and enforcement of both driver and nonmotorized road user behavior. Watch for Me NC activities are managed by the Kill Devil Hills Police Department, but several different agencies participated in various education and enforcement initiatives throughout the program. In addition to Dare County and the Dare County Sheriff’s Office, several municipalities participated, including Duck, Kill Devil Hills, Kitty Hawk, Nags Head, and Southern Shores. Within these municipalities, the planning departments, sheriff’s offices, fire departments, local schools, police departments, and area hospitals have all contributed to different Watch for Me NC activities. Watch for Me NC partners in Dare County participated in a number of education activities to engage local students, parents, and children. Partners provided crosswalk and bicycle safety presentations, distributed materials at various special events including school open houses, and conducted outreach through activities for young children. Each activity engaged different residents within the greater community. Dare County conducts enforcement operations a couple of times of year, usually in the summer tourist season. During enforcement operations, law enforcement focuses on educating all road users and giving warnings or citations to road users demonstrating dangerous behavior. The Watch for Me NC program has had a profound impact on Dare County’s local police departments. Officer Sarah McDowell of Kill Devil Hills says there was an early assumption that all officers were very familiar with traffic regulations for bicyclists and pedestrians. This assumption was inaccurate. Now, as a result of Watch for Me NC, the officers are better educated and have more clarity on bicycle and pedestrian rules and regulations. Officer McDowell attributes the success of this program to encouragement and reinforcement from the municipal police chief, who is “100 percent supportive,” as a key to sustaining the momentum of the initiative. Watch for Me NC has also generated interest in safety among many local residents, especially those walking or bicycling for fitness or recreation. 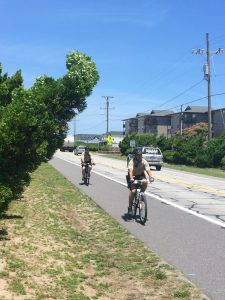 In the future, the Watch for Me NC program in Dare County hopes to better connect with organizations that align with these residents, such as the Outer Banks Pedestrian and Bike Safety Coalition. During the peak tourist season, many Dare County businesses hire seasonal international employees. To better address this community diversity, Dare County is building relationships with large local employers, such as grocery stores. Additionally, since the area experiences vastly different travel patterns throughout the year, plans have been made to implement specific activities for tourists while not disregarding the importance of engaging locals. Moving forward, Dare County Watch for Me NC partners hope to implement an evaluation method for education and enforcement activities to track their efforts and progress toward achieving goals. Thank you to Officer Sarah McDowell with the Kill Devil Hills Police Department for providing leadership, time, and expertise that contributed to the Watch for Me NC Campaign in Kill Devil Hills and the information in this profile.